Brenda Blogs About . . .: This is Halloween! Halloween is so much more stressful now that I’m a grown up with a grown up job (and a grown up commute to go with)! I’ve always loved Halloween. Maybe it’s the theatre person in me, but I just loved putting on a fun costume and going around trick or treating when I was a kid. When Aaron and I bought our house a couple years ago, I was so excited at the idea of having trick or treaters come to the house and handing out candy to them! Up to that point in my adult life, I had lived in apartments that saw little to no trick or treaters. But it’s hard to get home in time to actually hand out candy! When I did the young adult Halloween thing throughout my twenties – going to West Hollywood and walking amongst the throngs of people, going to parties where half of the girls (including myself) copied Mean Girls and wore lingerie and mouse ears (“I’m a mouse, duh!”) – it was fine because those parties would last all night. It didn’t matter how late we got off work because we knew the party would still be going when we got there. This year, I was definitely ready to embrace my role as new mom, but nervous about getting home in time. Let me start by saying, I just love babies in costumes. I think one of the cutest images ever is that of a baby dressed up in some cuddly costume. One of the bonuses to having had so many friends have kids this year was the influx of costumed babies in my facebook feed. 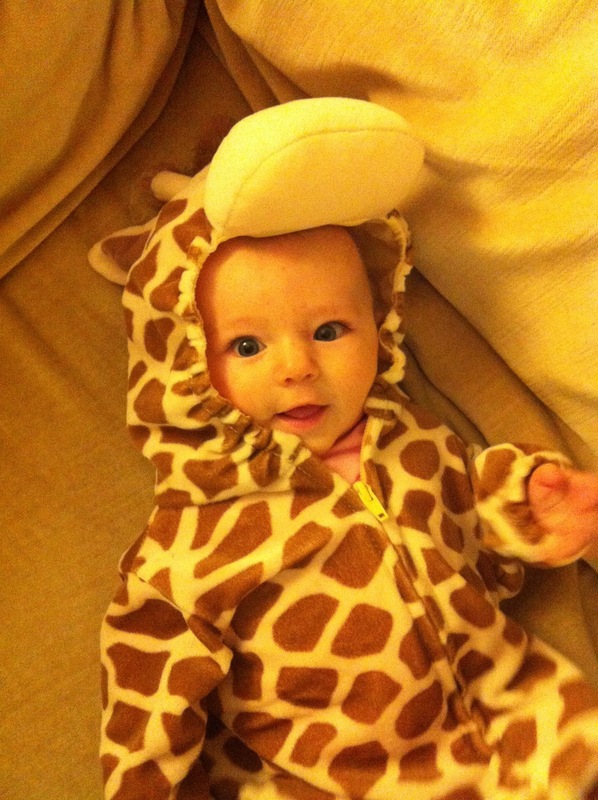 I was so excited at the idea of putting Guinevere in her little giraffe costume and taking her to our neighbors for “trick or treating.” I use quotation marks bc I definitely did not want to collect any candy from our neighbors – really just wanted to show off my cute baby. Unfortunately, traffic did not want to cooperate. This is where the extra stressful part of Halloween rears its ugly head. I’m not sure what time trick or treating starts, but I seem to remember from my childhood that it begins somewhere around twilight and then continues until 8 or 9pm. 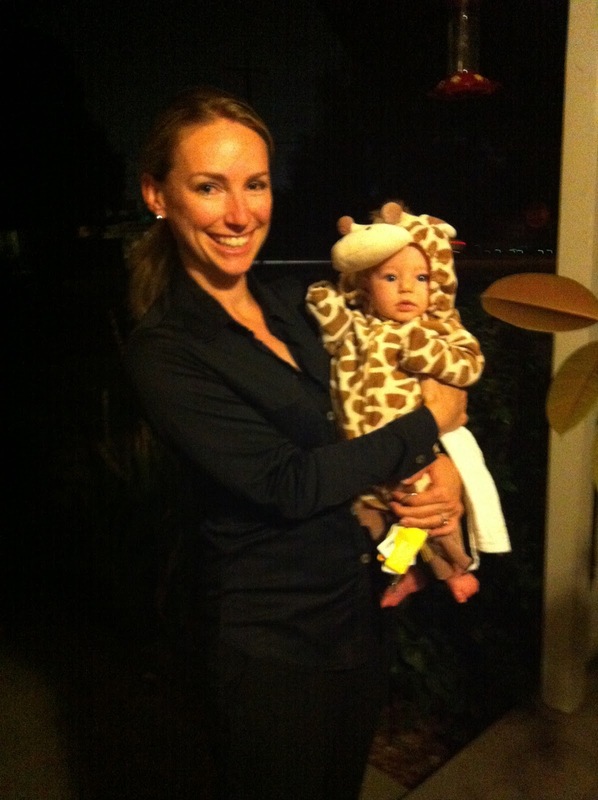 I needed to leave work in time to pick up Guinevere from daycare and be home in time for trick or treaters. I checked traffic online and it looked horrendous, so I left work half an hour early. An hour and a half later (i.e. the time I was supposed to be picking G up from daycare) I was not even on the freeway! LA traffic is usually bad, but this was ridiculous! I could have walked to the freeway faster. All I could think about was my poor baby and how much I just wanted to be home with her in her costume. I finally picked her up at daycare two hours after leaving work. Then, on the way home from daycare, one of the major intersections that I usually cross was closed, so we had to make a rather large detour just to get home. In all, it took me two and a half hours to get home! I pulled up to our house in time to see a wave of trick or treaters bypass my house because we had no decorations up. Once home, I put out the large pumpkin that we purchased at the pumpkin patch over the weekend. Unfortunately, I hadn’t had time to carve the pumpkin , so I just set it out whole. Maybe I’ll make pumpkin pie or pumpkin bread or something with it since it’s not all gross from being used as a jack o lantern. I had been meaning to carve the pumpkin yesterday or Monday evening, but Aaron has been working late for the past couple days, and by the time I put Guinevere to bed each night, I was so exhausted, I just went to bed too. Anyway, I put Guinevere in her little costume and then put the bowl of candy out on the porch while I took her over to the neighbors. After 15 minutes of the neighbors “ooh”ing and “aah”ing over her, I was pleasantly surprised that the bowl was still relatively full when we returned. In all, it was a fun, if quiet and short Halloween. I think the moral of the story is that next year I will take a vacation day or a half-day on Halloween. I don’t want to be rushing home like that ever again! Isn't it crazy how different holidays are now? 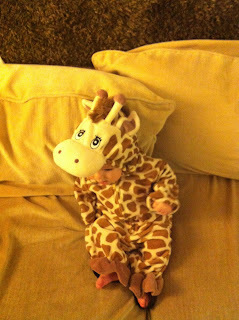 But Guinevere looks PRECIOUS in her costume!